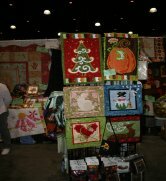 Thank you to all who stopped by our booth at the World Quilt Show in West Palm Beach last weekend. It was so great to see all the familiar faces and catch up on everyone's recent events. We have missed all the updates of babies, grandchildren, weddings and more. The hugs from all were greatly appreciated. We were overwhelmed by the warmth and good feelings you gave to us. The other booth mates around us kept coming and telling us how surprised they were of our reception and they loved being near us. Thank you so very much again. We worked very hard to present you with MANY new items at the show; so glad you enjoyed them! Most are now available at our web store at www.jampatch.com with more to be posted as soon as we can. In fact, you must take a look as we are participating in our first virtual SHOP HOP. The directions to join the fun are on the front page of our site. It is so easy to participate in the FABSHOP HOP and follow the "bunny" - just click on the "register now" tab and have fun! If you look at enough shops you can win the grand prize of a sewing machine. Only one machine to be given away but there are tons of prizes to win while you shop. Take a few minutes to browse. As Thanksgiving approachs, extremely quickly, we must thank each of you for your continued support. Thanks to the gals and guy who helped The JaM Patch store-front for the past 6 years. Thanks to all for understanding why we chose to close the store. We have always said "family first" and it is so great to spend time with them. We are anticipating our first holiday free and loving it. Don't miss out on the specially priced Duffel Bag Kits. 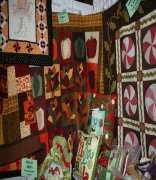 It is a great deal: 4 yards of fabric (2 of each color for you to making the quilting sandwich); the free pattern and, if you chose a zipper for $35.00. It is $32.50 without the zipper. May you each have a blessed Thanksgiving. We hope you can spend some time with your family and friends, as we plan to do.